Want a room with a view? How about a house with a view? Enjoy your Blue Ridge cabin rental stay while taking in the natural beauty of the North Georgia Mountains. Along with the view you can expect privacy. Our cabins are not stacked on top of each other, nor side by side to one another. A natural flow of green mountain scenery floods the valleys and peaks. Browse our selection of Mountain View log cabin rentals and find the one that is perfect for you. The team at Georgia Mountain Cabin Rentals is proud to offer a wide variety of lodging options to our valued customers. We want you to have the experience of a lifetime, and that starts with having a comfortable place to sleep and relax. 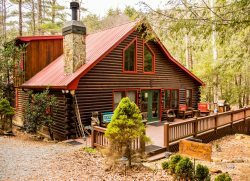 All of our cabins in Blue Ridge, Georgia, come with a long list of amazing features including hot tub access, the internet, game tables, and more. In addition to these amenities, you will also have close access to amazing locations throughout the North Georgia wilderness. Better yet, our cabins are easily accessible as we are just 90 minutes north of Atlanta and 90 minutes southeast of Chattanooga, Tennessee. If you would like to learn more, or if you want to reserve your stay, contact the team at Georgia Mountain Cabin Rentals today!